StoryEngine is a narrative-based methodology that can be used for research, evaluation, and grant reporting. Drawing on deep listening and participatory approaches, StoryEngine systematically collects and analyzes successes, challenges, practices, perceptions, and more — while generating assets that participants can use to promote and amplify their work. StoryEngine was specifically designed to serve organizational learning and innovation, power feedback loops, and provide insights to guide strategy and design decisions. Most importantly, it recognizes that an interview is an experience — a touchpoint with an organization — and therefore an opportunity to build relationships, provide support, and make connections. StoryEngine uses in-depth interviews to draft impact narratives that are then co-edited in collaboration with each participant. These narratives can then be used to generate assets — for marketing and communications, advocacy, onboarding, and more — while together forming a dataset that can be analyzed to surface insights and learning. Leadership — StoryEngine can power a range of strategic initiatives, including strategic planning and organizational development, learning and innovation, and constituent feedback loop programs. It can also provide insights and examples that help communicate to key stakeholders — especially donors and board members. Systematic listening can surface trends and emerging issues, generate examples that explain complex issues, and humanize quantitative data in ways that help others “get it”. Participants / Interviewees — StoryEngine participants can include the people an organization serves, as well as partners,volunteers, or network members. Participants in the pilot phase often reported feeling energized and validated by their StoryEngine experience — by the act of being listened to, the supportive facilitation, and because we created a space for reflection. They also mentioned that they learned from reading others’ stories, and that articulating their thoughts and experiences was a way to support others. Participants appreciated the production of a narrative that they could use for their own purposes, and many went on to share publish their stories via blogs, newsletter, or social media. This was especially true when their story was shared and promoted by others. 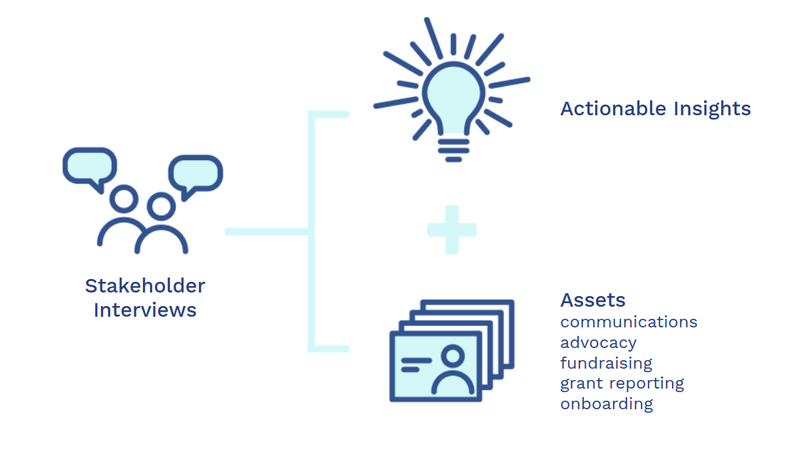 Network- / Member-Driven Organizations — StoryEngine can surface details about impacts, perceived benefits, or service / value gaps, providing important insights that can guide the refinement or development of value propositions. The deep listening approach also provides an important experiential touchpoint — and an opportunity to connect and support members, affiliates, or grantees. Program / Service / Product / UX Designers — Emerging from participatory and human centered design practices, StoryEngine is particularly well suited to deliver the insights required for the initial discovery / inspiration / empathize phase. It is easy to surface robust customer profiles and journey maps from narratives. More importantly, StoryEngine is different from other methods in that it is non-extractive — it includes ways to generate value to participants — and can provide a platform for inquiry and feedback throughout the design process. M&E / Assessments / Learning & Insights — StoryEngine complements and can be combined with other methods, both quantitative and qualitative. The methodology draws from utilization-focused and developmental evaluation approaches, and shares the focus on intended users and uses, as well as providing rapid insights to innovators. StoryEngine can be particularly useful for large-scale, multi-year research projects, providing early outputs and communication assets that can build and maintain engagement among stakeholders. Communications &Advocacy / Grant Writers / Development Teams / Marketing / Public Relations — For those tasked to inform, engage, and advocate for an organization, a cause, or a course of action, StoryEngine insights and assets can support decision making around strategy and channels, develop messaging and content, and provide detailed examples to bolster arguments and illuminate existing or potential change pathways. The power of stories in these fields is well understood; the difference with StoryEngine is that it provides a framework to generate them that is values-based and non-extractive, taking the needs and purposes of participants / interviewees into account. Funders & Grant Managers — Grant reporting can be onerous and frustrating for grant managers — and overwhelming for grantees. StoryEngine has been tested as a grant reporting mechanism, focusing on learning and reflective practice and complementing the tracking of quantitative measures. This approach produces (1) a story for public sharing; (2) an internal story with more sensitive details, optionally accompanied by learning notes; (3) a dataset that can be analysed for patterns and insights about the grantmaking program as a whole. Since many grantees function within a particular field or ecosystem, the benefits listed above under Partners and Networks also apply. Conference Organizers & Attendees — Riffing off of Humans of New York, a version of StoryEngine can be used to create an inviting and engaging space at conferences and events. In the context of a podcast lounge or "braindate" space, participants can get interviewed in 15 minutes or less, interview and connect with another attendees, and explore others’ audio or text stories. The resulting audio files can generate assets (example from MIT) and insights, just like regular StoryEngine narratives (except permission to publish is granted before interview because the audio is shared immediately). This flavor or StoryEngine was first designed and launched as “Humans of the Internet” — in collaboration with Ravensbourne Digital Design students at MozFest 2017 — and collected over 80 narratives over two days. Learn more at StoryEngine.io/humans. Recruiting & Onboarding / Human Resources — StoryEngine stories can be used to augment recruiting and onboarding processes. For example, stories can be used to assess candidate&apos;s analytic skills as well as their capacity to edit or synthesize information. Stories related to a specific program or topic can also be used to onboard new staff, partners, or volunteers, providing rich contextual information and details that allows them to better connect with the people served by an organization.